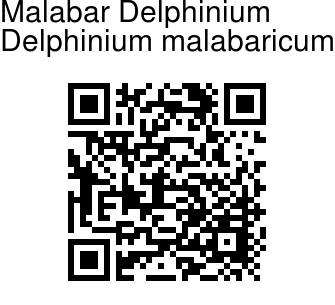 Malabar Delphinium is a large perennial herb, 50-100 cm tall. It has erect, hollow stems. Alternately arranged leaves are palmately lobed. Lower leaves, arising from the root, large, reniform, 5- 7 lobed. Stem leaves present with narrower segments and hairy upper surface. 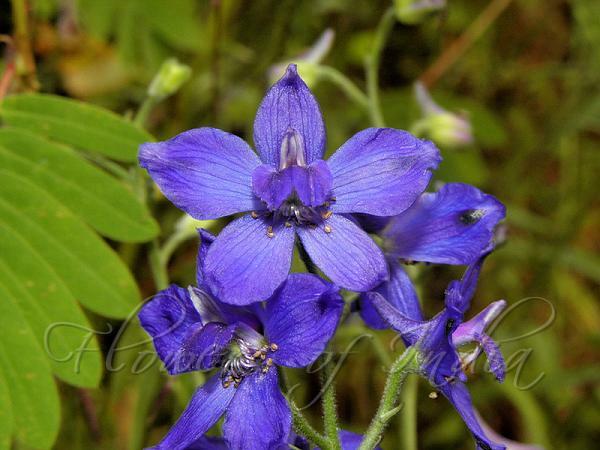 Beautiful blue flowers occur in lax 30 cm long racemes, at the end of branches. Five sepals, 2 cm long, have a white spot near the top. There are 2 small petals which are 2-lobed. Flowering: October.